Managing Protected View in Excel 2010/2013 » Accounting Advisors, Inc.
As you migrate to Excel 2010 or 2013, you may sometimes encounter spreadsheets that open in a special Protected View mode. You can view – but not edit – such documents until you grant permission within an onscreen prompt. I'll explain Protected View and how you can adjust this security measure to suit your needs. By default, Microsoft Excel 2010 and later assume that files opened from the Internet, e-mail attachments, or other certain locations could contain malicious programming code. Accordingly, Excel opens such documents in a special mode known as Protected View, which enables you to view, but not edit, the spreadsheet. You're notified of Protected View by way of the security prompt shown in Figure 1. You'll notice that Excel's ribbon user interface is collapsed as well, since virtually all functionality in Excel is disabled except for navigating the workbook and copying selected cells to the clipboard. If you wish to edit the spreadsheet, you must click the Enable Editing button shown in Figure 1. Figure 1: Protected View allows you to safely review documents of unknown provenance. There are two ways to get to the settings that determine when Protected View is automatically invoked. 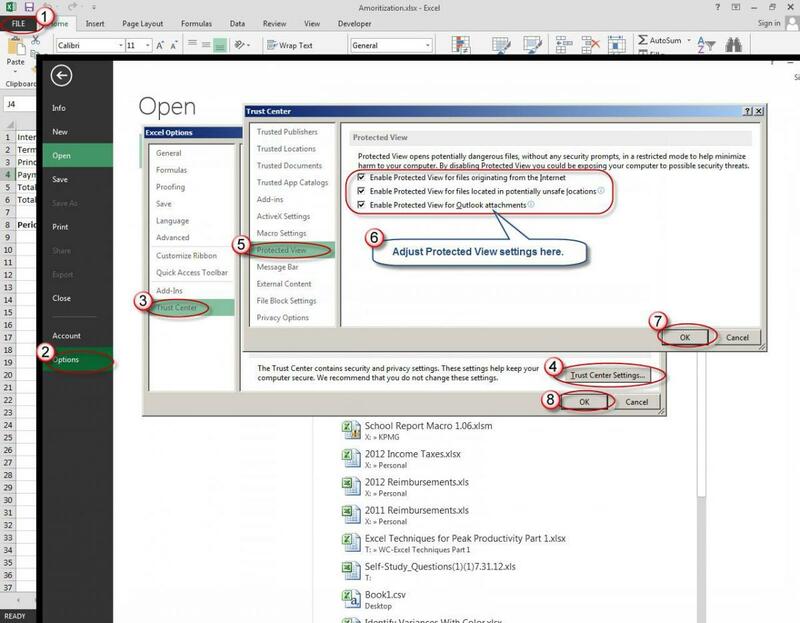 If you open a document in Protected View, you can click on File, Info, and then choose Protected View Settings as shown in Figure 2. 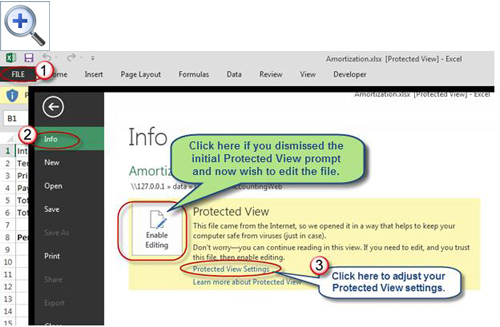 Figure 2: The Info option in Excel 2010 and 2013 allows easy access to Protected View settings. Choose File, and then Options. Within the Options window, choose Trust Center, and then click the Trust Center Settings button. Within the Trust Center Settings, choose Protected View, and make any adjustments necessary, and then click OK twice. 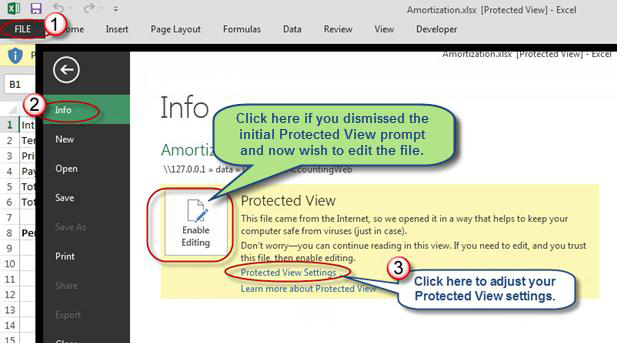 Figure 3: You can also access the Protected View settings through Excel's Options dialog box. Thirty-two-bit versions of Excel 2010 offer an additional check box labeled Enable Data Execution Prevention Mode. 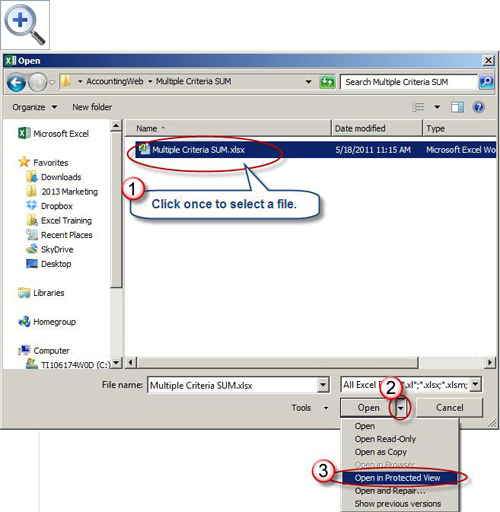 This option was removed from Excel 2013 and does not appear in 64-bit versions of Excel 2010. This setting prevents poorly written programming code in Excel add-ins from potentially crashing your computer and should always be left enabled. Data Execution Prevention cannot be disabled in Excel 2013. Press Ctrl+O to launch Excel's Open dialog box. Click once on the name of a document. 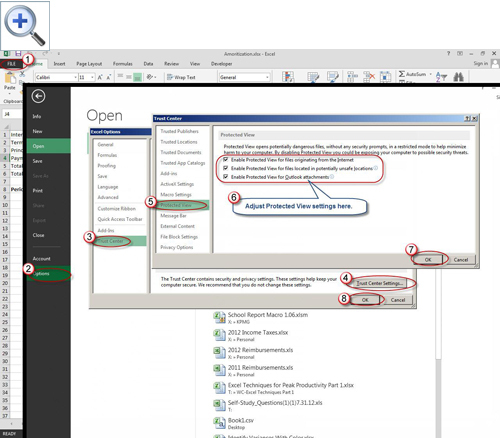 Choose Open in Protected View from the Open button's menu, as shown in Figure 4. 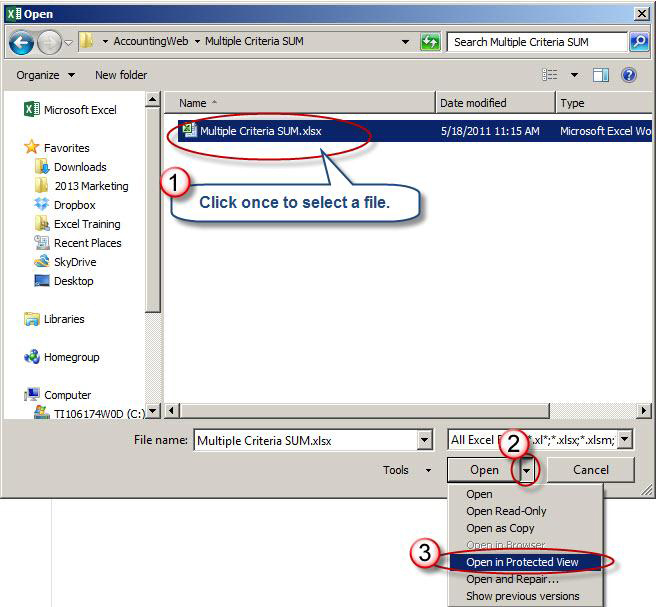 Figure 4: You can manually open unknown documents in Protected View in Excel 2010 and later.